Leaders in the natural gas vehicle sector in Russia, including Viktor Zubkov, Chairman of the Gazprom Board of Directors, have met at the premises of AVTOVAZ in Togliatti, Samara Region, to discuss issues related to developing the domestic NGV market and stimulating supply and demand for natural gas-powered machinery. Representatives of foreign automakers were also present. Taking part in the event were Anton Inyutsyn, Deputy Minister of Energy of the Russian Federation, Alexander Morozov, Deputy Minister of Industry and Trade of the Russian Federation, Vladimir Markov and Vyacheslav Mikhalenko, Members of the Management Committee and Heads of Departments at Gazprom, representatives of the Ministry of Transport of the Russian Federation, leading domestic and foreign automakers – AVTOVAZ, GAZ Group, KAMAZ, RariTEK Holding, UAZ, Hyundai, Kia, Renault, and Volkswagen – as well as financial organizations. Russian manufacturers currently offer more than 220 models of natural gas-powered vehicles. These include mostly passenger vehicles (buses and minibuses), trucks (dump trucks, box trucks, garbage trucks, etc. ), and special vehicles (such as tractors, bulldozers, and mobile cranes). However, in order to ensure the use of natural gas as a vehicle fuel on a mass scale, capacities to manufacture a broad lineup of affordable cars need to be created. 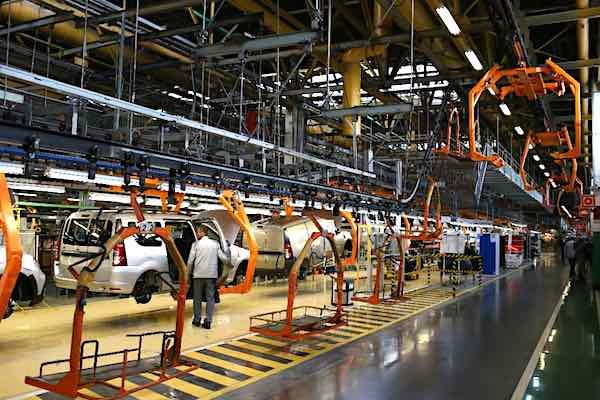 No more than 20,000 factory-built NGVs were produced in Russia over the past five years (in 2014–2018). This amount is not sufficient to facilitate active development of the domestic NGV market. A Gazprom delegation paid a visit to the production facilities of AVTOVAZ, including the assembly shop where cars are converted to natural gas, and the new Gazprom CNG filling station in Togliatti. The production and marketing of natural gas as a vehicle fuel, as well as the expansion of the domestic NGV market, are among the strategic areas of Gazprom. 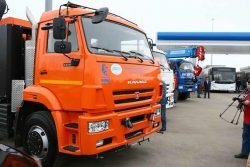 Cooperation agreements have been signed with, among others, AVTOVAZ, KAMAZ, GAZ Group, UAZ, Kirovsky Zavod, ATS, Sinara-Transport Machines, Concern Tractor Plants, Kurgan Plant of Road Machines, VOLGABUS, and KOMMASH-GRAZ.